From April 6, we accept reservations for the following N Scale railroad models of Kato. This is Kato's first wireless power pack. This is connected to your smartphone or tablet terminal by Bluetooth and use it. Hachiko Line is a railway line connecting the west part of Tokyo - Saitama - Gunma prefecture. Kawagoe Line is a railway line in Saitama Prefecture. Series 205-3000 used in this route is replaced by Series E231-3000. E231-3000 was originally modified from E231-0 used in Chuo Line & Sobu Line Local Train. 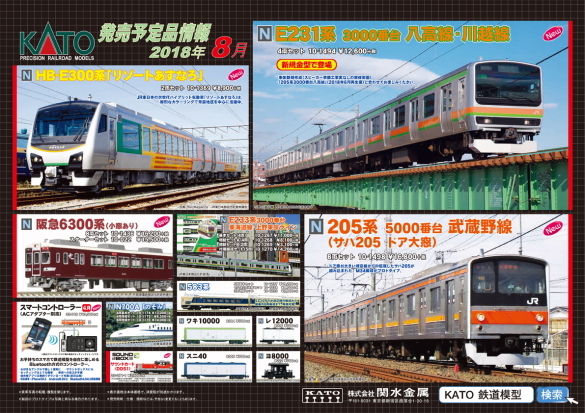 At KATO we model E231-3000 with a new mold. Musashino Line is a railway line from west Tokyo to Chiba prefecture via Saitama prefecture. It is a semi-circular line connecting several satellite cities near Tokyo. Series 205-5000 used in this route is replaced by Series E231-0. E231-0 was originally modified from E231-0 used in Chuo Line & Sobu Line Local Train. Musashino line's unit is an 8-Car unit. In the model of this time it is a feature that the windows of the 4th car and the 5th car are large only with the window of the door. The reason is complicated. Originally Yamanote line was the No. 1 car from No. 1 car, No. 3 car from No. 6 car. And only the 4th car and the 5th car were the Saikyo line. The reason is complicated. The cars 1 - 3 and cars 6 - 8 were originally Yamanote Line. And the cars 4 to 5 were originally the Saikyo Line. In other words, it is composed of used cars on multiple routes. It is a sequel to the hybrid diesel train "HB-E300". Resort Asunaro is a tourist train that is driving in the Aomori area. It is a gorgeous design using yellow, orange, green on the car body. It is driven mainly by Ominato Line, Tsugaru Line, Ou Main Line. Exceptionally there is a record that was also driven by Oga Line and Yamada Line. Series 6300 is an express train of Hankyu Kyoto Line. The model is an image of the figure of around 2001 - 2008. Hankyu Train features a car body with a glossy glossy color. KATO will reproduce the paint as well. This is an introductory set recommended for those who want to start N Scale Railroad Model from now on. The included controller is the new "Power Pack Standard SX". This is a sound card that you can enjoy sound effects by attaching it to the Sound Box. DD51 is the most famous model of Diesel Locomotive in Japan. DD51 is used for sleeping limited express trains, regional local trains, freight trains, various trains. Please enjoy the engine sound together with this Sound Card! These are the classic Freight Car Series. Price and JAN Code were changed from this production.